It’s often easy to overlook the many perils and pitfalls that lurk just around the corner when working on your car. Sure there are more minor injuries such as busted knuckles, a pinched finger, or the occasional burn when working on a motor that’s still warm, however more serious injuries can also result from carelessness or even so much as a momentary lapse in judgement. Two such times when you are at particularly high risk are when jacking up your car and when working under your car. While it doesn’t take a genius to imagine that the result of a car falling on top of a human would be uncomfortable at best and fatal at worst, most would agree that the car is going to win…every time. This is a more common occurrence than one might expect, and one that results in more trips to the emergency room and more trips to the morgue each year than any other automotive wrenching related injury. Fortunately for all of the shade tree mechanics out there, this type of injury is one of the easiest to avoid as it merely requires a little bit of common sense and good sturdy equipment. The most obvious way to keep yourself safe when lifting your car is to make sure you have a good high quality floor jack. However, a floor jack alone is not enough. Floor jacks have moving parts that are prone to wear, and they can become weak or outright fail with use and time. The particularly scary part about floor jack failures is that they often come in the form of a slow leak. As such, they have been known to slowly let a car down on top of someone as the hydraulics lose pressure and the problem is often noticed only after it’s too late to escape. This is why it’s never a good idea to climb underneath your car when it is only supported by a floor jack. So what should you do to make a raised car safe to climb under? Enter the jack stand. Below is a quick reference table designed to give you quick and easy comparison before we dive too deep into the article. The table consists of the makes and models of some of our favorites, as well as relative price and average rating. If you want a more in depth look feel free to skip ahead. However, if you are just looking for a quick recommendation, this table is for you. What is a Jack Stand? A jack stand is a critical safety item when it comes to working underneath your car. The jack stand is an adjustable height mechanical structure or frame that is used to support your car once lifted. It provides a solid mechanical stop to prevent your car from falling, which means you don’t have to rely solely on the hydraulics of your floor jack (which you should never do). 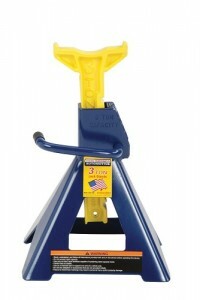 Unlike a floor jack, a jack stand has very few potential points of failure. The typical jack stand consists of an A-shaped base frame, a ratcheting post attached to a platform upon which you rest your car, and a ratchet handle mechanism. Most jackstands allow you to pull the platform upward freely, but to lower the jack stand you must disengage the ratchet mechanism. It is nearly impossible to release the ratchet by accident once a car is resting on the stand, because to do so would require you to lift the weight of the car using only your hand strength. When/Why Do You Use a Jack Stand? First, as mentioned previously, hydraulic jacks can and will occasionally fail, particularly cheap ones. If you are solely relying on a jack to support your car, your car is prone to falling. This can cause damage to you or your car. A jack stand is a fail safe against this type of event. Second, if you raise your car with just a floor jack, you only have one point of contact. In some cases this can be stable, but if you are lifting from the middle of a car, such as from the rear differential, this can leave your car wobbly and prone to tipping to one side or the other, whether it is apparent or not. Jack stands allow you to have multiple points of contact when supporting your car so you avoid tipping issues, even if you aren’t under the car. It is always advised to give you car a little shake before climbing under to verify the stability of your setup. First and foremost, a floor jack consists of moving parts that can wear over time. A jack can appear to function normally, but due to the nature of hydraulics, a well worn jack can slowly bleed off pressure and lower the car. As such, it is always good practice to lower your car onto your jack stands and not rely on your floor jack at all to hold your car up. Instead, rely on the floor jack to do the lifting, but let the jack stands do the holding. 2. Use one jack stand per wheel that is not touching the ground. For every wheel that’s in the air, it is recommended that you use at least one jack stand. To maintain stability, you always want your car to have four points of contact with the ground or with a jackstand. One thing to look out for is that sometimes, depending on where you jack your car up from, you can have a wheel that is visibly contacting the ground but the car’s weight is not firmly planted on it. You will know this is the case because the suspension on that corner of the car will be decompressed. In cases such as these, it is recommended that you adjust your lifting strategy so that the wheel is firmly planted on the ground or so you can lower your car onto a jack stand in that corner as well as the one you are working on. 3. Position jack stands using proper lift points on your car. It is important to be aware that there are specific points on your car where it is safe to place a jack stand. These are typically referred to as jack points, jacking points, or lift points and are reinforced to be able to hold the weight of your car. These locations can typically be found in your owners manual. If you have lost your owners manual or bought a used car that came without one, you can also do a quick online search or post on a forum related to your make and model of car. Failing to use proper lift points can cause damage to your car or can cause your car to fall. 4. Use jacks that have sufficient capacity to hold your car. Jack stands are typically rated to a certain capacity which is most often conveyed in tons. Due to weight, a Hummer H2 is or BMW 7 series is going to require a heavier duty jack stand than a Toyota Prius or Honda Civic. You can typically determine the weight of your car using your owners manual or searching the internet. A good rule of thumb is to buy jack stands that can hold the double the weight of your car. As an example, if you have a 4000 pound (2 tons) Mercedes S55, your jack stands should be able to hold at least 8000 pounds (4 tons) total. This way you have some safety factor built in should your car not have perfectly even weight distribution. Also, remember to check whether your jack stands are rated for capacity individually or as a pair. 1. Consider the type of car you will be working on. Jack stands come in all types of different heights and varieties. The most notable difference is size, specifically height. Jack stands vary in height quite a bit, so it’s important to choose one that is either tall enough or short enough to suit your car. The most important facets to consider are your car’s ground clearance and weight. Automobiles such as a Porche 911 Turbo or a BMW M3 are going to be low to the ground and relatively light weight compared to SUVs such as a Ford Explorer or Cadillac Escalade. As such, the Porsche and BMW will benefit from a shorter jack stand and a jack stand without a ton of weight capacity will suffice quite nicely. On the other hand, the Ford and Cadillac will need a taller stand to reach the bottom of the car when the wheels are off the ground and since these cars are on the heavier end of the spectrum, you will need to bump up the weight limit on your jack stand. The jack stand is a relatively simple tool, but as with any manufactured item, there are vast differences in build quality. A general rule of thumb with tools is that buying nice tools that will last forever is ultimately cheaper in the long run than buying a cheap version of the same tool multiple times. Jack stands are no different. Jack stands that are rated to capacity are going to be reliable to that capacity no matter where they were manufactured or who made them. The big difference is in fit, finish, and corrosion resistance. Using a rusty jack stand is no fun and over time the rust could compromise the integrity. The best way to determine build quality on a jack stand is to view a couple of things. First look at the finish. It should be smooth, even, and have full coverage. If there are gaps or cracks, it’s probably not going to last very long. The other thing to look at is the quality of the welds. The weld beads should be even. If it looks like it was gobbed onto the structure, chances are it was not a very clean weld. Unfortunately not everyone has the ability (or desire) to go to a shop and look at jack stands with their own eyes. As such, the obvious other solution is to read reviews such as the ones below and let other people do this work for you. The Torin 3 Ton Double Locking Jack Stands, more commonly known as “Big Red” jack stands, are the old stand by. They offer an outstanding price to quality ratio, meaning they are an outstanding value. The have a few really cool features that make them our go-to jack stands. The first is that they have a 3 ton capacity, so they should be suitable for pretty much any economy car or sedan. They will also be fine for some light trucks. At the bottom of their travel, the minimum height is 11.2 inches and they extend all the way up to 16 inches at their highest point. They have a self locking ratchet so when you lift the platform on the stand it locks in place. As an additional safety factor, these stands have a secondary pin that you can place to ensure that your stand is not going anywhere, which will give you peace of mind when working on your car. The Torin Double Locks also have a really wide footprint, so you can get away with using them on softer asphalt or even hard packed dirt without fear that they will sink into the ground (although you should use judgment when evaluating the ground prior to doing this). These jacks are welded steel, so they feel very heavy and sturdy in hand. They also have a passable fit and finish, with relatively clean welds and uniform finish. While these certainly aren’t the nicest stands money can buy, they are a great value play as there are few other stands that rival them at the price point. They will get you by in almost any situation, and that’s why they come so highly recommended. And as an added note, these are available in 2 ton and 6 ton varieties as well. When it comes to heavy duty stands, it’s tough to top the Wilmar 6 Tons. These are easily recognized as they sport a rather vivid yellow finish that is nicely contrasted with white ratcheting platforms. These stands are of welded steel construction, and fit and finish is good. The welds are of high quality and the finish on the material is smooth and even with no missed spots. These stands are known for their simplicity as they have no secondary locking feature that you have to worry about. They have a large footprint and they have quite a bit of stroke length. One thing that should be noted is that because these stands are high capacity, they have a rather high minimum height of 15.5 inches. This shouldn’t be a problem because most cars and trucks that would use a jack stand this large would have enough ground clearance to warrant their use over a shorter stand. Along with the high minimum height comes a high maximum height of 23.5 inches, which is tall enough so that a truck or SUV will have it’s wheels off the ground when sitting on the Wilmar 6 Tons. 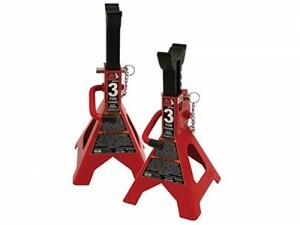 As far as price goes, these are some of the more affordable 6 ton jack stands. 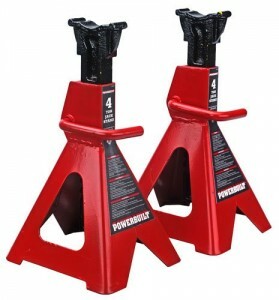 There is really no need to spend more on a set of 6 ton jack stands unless you want style points as these will perform admirably under pretty much any circumstance due to their quality. If you need a set of 6 ton jack stands, you should have no reservations about picking a set of these up as they will treat you well and last a lifetime. The Torin 3 Ton Aluminum Jack Stands are pretty unique. First and foremost, they are made from cast aluminum. The result is that they are exceedingly light compared to most other jack stands on the market. In fact, they weigh roughly 2/3 what comparable steel jack stands rated to the same capacity weigh. If you use your jack stands often, you already know what a pain it can be to lug heavy jack stands around, particularly if you have a set of sockets or other tools in hand already. On the other hand, these stands feel weightless after you’ve had other sets. Another interesting feature is that these stands are non-ratcheting. This means that you must place a pin to hold them up. Placing a pin in shear as these stands do is the safest way you can support your car. While ratcheting mechanisms are safe, pins are fool proof. The pin also has a spring loaded bearing in place to prevent accidental removal. 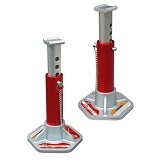 These jack stands have a minimum height of 10.75 inches and raise all the way up to 15.63 inches, which should cover a wide range of cars without any problems. Their base is large and solid, so there is no better jack stand for working on dirt or other softer ground such as asphalt (but again, please be smart about what terrain you place the stand on…they won’t work in mud obviously). Fit and finish is outstanding, with clear anodized base and platform as well as red body. In our humble opinion, this is the best looking jack stand on the market for what it’s worth, and considering the all aluminum construction and high quality the price makes this value excellent as well. 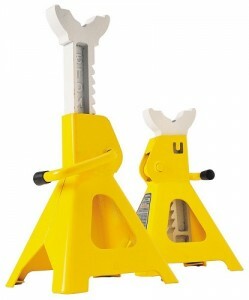 The Hein-Werner 3 Ton Jack Stands are extremely nice. They are made in the USA (although they admit to sourcing some components from abroad), and as such they are considered to be high end. As a result, they also cost a little bit more than some of the others we have recommended. Nonetheless, considering the quality, you get quite a bit for your money. Overall fit and finish is outstanding, and the blue and yellow color scheme looks great and really sets these off. They are quite eye catching. There are no qualms with the build quality, as these stands appear to have been constructed with great care. 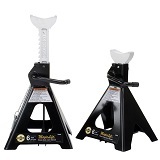 These jack stands have a ratcheting mechanism that works well that doubles as a carrying handle and a nice wide platform with a small recess in it to keep your car firmly positioned and stable. The wide footprint and folded metal footing makes these ideal for use on a number of different surfaces as they spread the pressure out and aren’t likely to sink into the surface or damage the surface that they are resting on. The minimum height is 12.13 inches and the maximum height is a whopping 19 inches so they shouldn’t have trouble supporting most SUVs. These stands are steel, so they are going to be heavier than the aluminum stands discussed above, but they are not overly burdensome. All in all, these stands would make a nice addition to any garage mechanic’s tool set and if you are looking for fantastic quality jack stands, the Hein-Werners are highly recommended. With that, you are now an expert in the realm of jack stands. Considering that you’ve made it this far, you should have a pretty good idea about what to look out for. It’s important to remember that although we mention our favorites above, there are tons of great jack stands to be found out there, so our list is not exhaustive. If the above options don’t quite suit your fancy, it would be worth your time to have a look at a few more options, read more reviews, and compare prices by clicking here. And last but not least, don’t forget that you can’t use jack stands without first having a floor jack to go along with them!